The purpose of this report is to support the development of culturally competent resources to effectively inform farmworkers of their labor rights. El propósito de este informe es encontrar acciones comunitarias para ayudar a los estudiantes de origen indígena mexicano y sus padres a alcanzar sus metas educativas. David Bacon interviews three farm worker leaders in anticipation of UCLA Labor Center tri-natinal labor conference. First national study of labor conditions in multi-billion dollar nail salon industry. An assessment of the impact of 2017 statewide housing policies on Los Angeles County authored by the 2018 Community Scholars. This report is the first comprehensive study of drivers working for transportation networking companies in Los Angeles County. This multilingual educational booklet highlights housing rights and protections in California, as well as prohibitions against discrimination. This report is the first comprehensive study conducted in Los Angeles that details the adverse impacts of unpredictable scheduling on the city’s 140,000+ retail workers. Health insurance is an important factor in health care. Lack of health insurance dissuades people from seeking both routine and emergency health services. As of 2015, half a million Californians employed homecare workers. This study provides an understanding of homecare employers’ challenges, needs and employment practices in California. A new research brief explores the experience of the Black community in California through a labor and employment lens. As a result of widening inequality and a glaring lack of economic opportunities, California is in the throes of a Black jobs crisis. As a result of a lack of economic opportunities, widening inequality, and rising housing costs, the Black community in Los Angeles is experiencing a jobs crisis. This report considers how the lack of access to quality jobs is adversely impacting the community and draws a portrait of the challenges that Black workers in Los Angeles face. New study shows that EMS workers’ wages are low and stagnating and the jobs are dangerous, with high rates of mortality, injury, mental and physical trauma. 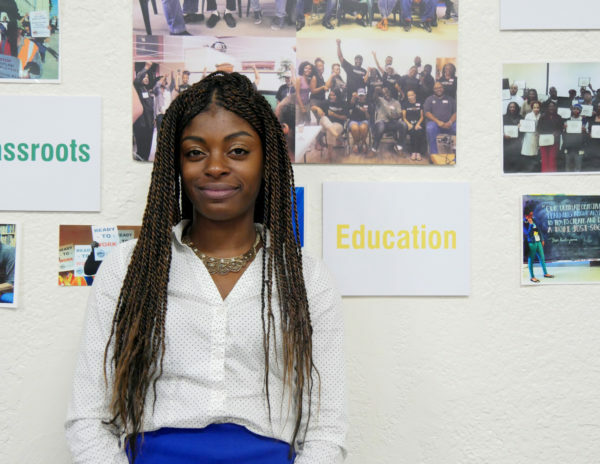 Young workers are a vibrant and critical part of the Los Angeles County service economy. Expanding on the findings of the I am a #YOUNGWORKER report, this report finds that young workers experience erratic scheduling practices, such as unpredictable schedules, lack of advance notice, lack of input, and on-call scheduling. Los Angeles houses the largest cut and sew apparel base in the U.S. and is the center of the country’s garment manufacturing industry. This report provides insights into the health, safety and environmental conditions of these garment factories. The report was based upon 307 surveys with garment workers in 2015. This report intends to understand the experience of undocumented youth in the Silicon Valley. While previous studies have found that immigrant communities face low wages and difficulties in accessing affordable housing, this study presents key statistics about educational and employment prospects for immigrant youth residing in this region. Undocumented youth counter the negative effects of being undocumented by making life choices that protect their emotional and physical health. The first statewide study of California’s domestic work employers, this report explores who domestic work employers are. Based on 501 randomly-dialed phone surveys throughout the state, this study provides demographic and household details, as well as an understanding of the employment practices and needs of domestic employers. This report explores the ways in which the criminal justice system can also lock workers on probation, parole, facing court-ordered debt, or child support debt into bad jobs. Because these workers face the threat of incarceration for unemployment, the report finds that they cannot afford to refuse a job, quit a job, or to challenge their employers. This resource guide provides a list of affordable healthcare options in the state that provide services to undocumented Californians. “Conveying Carwash Owners’ Stories: Competition, Diversity and Growth in the Southern California Carwash Industry,” a study- the first of its kind, provides an introduction to the industry, its owners, and the opportunities for this industry in Southern California. In this study, David Bacon focuses on five global campaigns: the PKC Maquiladora in Ciudad Acuña; the “El Super” Campaign in Los Angeles and Mexico City; the Cananea Mine in Sonora, Mexico; farmworker strikes in San Quintin, Baja California; and the Sakuma Farms/Driscoll growers in Washington State. Young people work to live, not to play. Study that reveals precarious conditions young workers experience in Los Angeles. Young Workers in Los Angeles: A Snapshot analyzes census data on young people between the ages of 18 and 29 working across Los Angeles County. This is a resource guide created in order to support Central American immigrant families and inform them of their legal rights, educate them on health and security, as well as feature places where they can enjoy free recreational activities. This report, conducted by Community Scholars, aims to understand economic survival strategies of the predominantly Latino immigrant community living in the Westlake and Pico-Union neighborhoods. This report, conducted by Community Scholars, provides a snapshot of renter conditions and housing supply in the Westlake and Pico Union area. It explores basic demographics of the area, current renter conditions, and housing stock. From the UCLA Community Scholars program, this report is a step-by-step manual on how to organize a health fair and other related public events in and around MacArthur Park. This guide is a companion to Re:Work radio’s episode Los Callejones, which provides a framework for workshops and classrooms to build storytelling skills while learning about the issues related to the garment industry. Policy Brief: Ridesharing or Ridestealing? This policy brief analyzes Los Angeles Department of Transportation taxi meter data from 2009 to 2014. The findings describe the economic impact of companies like Uber and Lyft on Los Angeles’s taxi industry. Undocumented youth live with exclusion from health services and fear of deportation, both of which cause and aggravate trauma. Drawing from a statewide survey of 550 undocumented and “DACAmented” Californians, this report examines how deportation impacts the mental health of undocumented youth. The report documents findings from a worker-led study, in which Garment Worker Center members, and student supporters, conducted a survey with local garment workers about their child care needs and the barriers they encounter. Nuestros Derechos como Trabajadoras del Hogar: Educación Popular para un Cambio Laboral is a popular education curriculum for domestic workers who are seeking to organize and know their rights. A report from the Economic Roundtable, the UCLA Labor Center, and the UCLA Institute for Research on Labor and Employment assesses the benefits and consequences of raising Los Angeles’s minimum wage to $15.25. A report by David Bacon on the perspectives of labor leaders from Mexico, the United States, and Canada on international solidarity and the future of labor. Un reporte por David Bacon que destaca las perspectivas de líderes laborales de México, Estados Unidos, y Canadá sobre el futuro del trabajo. Human Impact Partners examines the health impact of wage theft in the city of Los Angeles. A partnership with the Los Angeles Coalition Against Wage Theft. This reports explores the demographic, economic and political changes happening in Orange County. Low-wage workers experience labor violations regardless of their occupation or industry work. Therefore, this research project conducted by the wage theft report identifies policy efforts that would improve the conditions of low-wage workers. The interests of workers in the U.S. and Mexico are tied together. This report discusses and questions how solidarity between these two countries can and do function. The Integrated Organizing Approach (IOA) is an organizing method for low-wage workers engaged in struggles against multinational corporations. The case presented in this study demonstrates how the IOA can be a substantial asset for an organization in the design and execution of successful campaign strategies. A comparative study of targeted hire initiatives based on 14 in-depth case studies of project labor agreements and ordinances, as well as a scan of 20 examples of other targeted hire initiatives. When undocumented Californians do seek medical attention, the types of care available are Band-Aid options—basic services that provide a quick-fix or temporary remedy but do not address preventative, long-term, or sustainable health needs. These limited public programs are often the only option for uninsured Californians. Undocumented and Uninsured is the first study about and by immigrant youth on health care access. Researchers surveyed 550 immigrant youth throughout California. This report examines the challenges that workers have in recovering their hard-earned wages after winning a judgement in a wage theft case. This study looks specifically at what could happen to the low-income residents of the Valley and Hollywood, and the public employees who currently serve those areas if the Valley and Hollywood secede from Los Angeles. This Research & Policy Brief draws on a larger report published by the UCLA Labor Center’s California Construction Academy to discuss the role of PLAs or PSAs in creating high‐road construction industry employment and whether the LAUSD met the goals laid out in its PSA. In this report, we provide a statistical overview of the AAPI workforce in the United States. Wage inequality has been increasing within the AAPI workforce at an even faster rate than in the rest of the economy. Loncheras, or stationary food trucks, are predominantly microenterprises owned and operated by Latino families in their own neighborhoods, contributing to their communities’ economic development by keeping profits local. Breaking Ground, Breaking Silence documents findings from the first National Asian Pacific American Workers’ Rights Hearing, a historic gathering of over 200 Asian American and Pacific Islander trade unionists and community allies. This report focuses on the results of a survey of more than 4,000 workers in low-wage industries. Among its findings, every week in Los Angeles low-wage workers lose $26.2 million dollars in wage theft violations. On April 8, 2009, Los Angeles City Council passed an ordinance establishing a Green Retrofit and Workforce Program. This report explores how to effectively implement it. A landmark survey of 4,387 workers in low-wage industries in the three largest U.S. cities—Chicago, Los Angeles, and New York City. The first national study on wage theft. The Los Angeles Community Redevelopment Agency is taking a leadership role in trying to link the know-how of the building trades to an effort to create career opportunities for low income residents. On May 19, 2007, the UCLA Center for Labor Research and Education convened a hearing and conference on undocumented students about the pending California Dream Act (SB 65). This report highlights the testimonies of perseverance and hope presented by the students at the hearing. In 2002, the first ever California State Assembly Hearing on Asian Pacific Islander Workers brought together Asian Pacific Islander workers and advocates from all over California. This report synthesizes the issues and recommendations for workers, advocates, legislators, and communities.